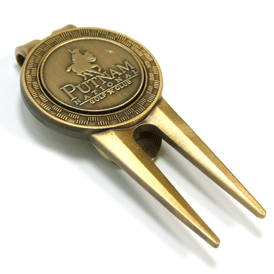 Be the envy of your friends on the greens with this customized divot repair tool that also serves as a money clip with a magnetic ball marker in the center. For gold plating or antique gold or antique silver plating, please add 20%. Pre-Production sample: 50.00(G) plus die charge. Sample charge refundable with order placed. Add 2 weeks to deliver time. Overnight shipping charges apply.